In short, because of the continual use of anthelmintic products, the livestock industry is being faced with a huge production challenge, parasitic resistance. In this case, parasitic resistance is described as the heritable capability of parasites to survive what would be considered an effective dose of an anthelmintic product. There are several reasons why this may have occurred on your farm including under dosing the animal (i.e. treatment not based on accurate body weight), repetitive on-farm use, failed dosing equipment (i.e. drench gun not dosing appropriate amount of anthelmintic due to an air bubble), or simply put, the continual and repetitive use of the products themselves. I understand that time is valuable and when we set out to do a task we want to get it done as quickly as possible. This may mean that we may not weigh every animal or that we treat every animal in the working system regardless if they are in need of a treatment or not. This is where the issue begins. Yes, anthelmintics still have a place in our production systems, but we must find alternatives to limit our use of these valuable products in order to prevent resistance from developing further and creating a greater issue. Therefore, if producers should limit the use of anthelmintic products, what other options do they have available in order to control parasitic infection? Although change can be difficult, simple changes in how you manage your flock or herd may just do the trick. For those that are able, rearing your livestock in a confinement-based system will significantly reduce issues with parasitic infection. Although rearing sheep in a confinement becomes expensive quickly, keeping your mind at ease knowing that parasites and other predators are no longer a concern in your operation may be well worth the investment. In addition, animals in confinement can be monitored more regularly and their diet can be managed more efficiently. An important note to mention that in this system, if your animals are coming off pasture and have no intention of returning back to pasture, consider treating all animals with an anthelmintic. If you were to not treat these animals, residuals worms from pasture will remain within the animal, consuming blood, until their lifespan is up. Some parasites can live in the host in this manner upwards to 6 months. For those that are more traditional in their management style and would rather decrease their feed costs by allowing their livestock to harvest their own feed, there are several management strategies that can be implemented on pasture as well. First of which is breed management. Specific breeds of sheep, including most hair breeds and some wool breeds, have shown to be tolerant to parasites. Record keeping systems, such as the National Sheep Improvement Program (NSIP), have EBV’s that focus on Worm Egg Counts (WEC). These parameters allow producers to choose breeding stock that are more tolerant and resistant to parasites as those selected individuals tend to shed fewer eggs resulting in an increased ability to naturally protect themselves from parasitic infection. The FAMACHA© eye scoring system is a quick, easy, and efficient method used to detect and determine when to treat for parasites on an individual basis. Using the Cover, Push, Pull, Pop technique, producers are able to determine an individual’s parasite status in a matter of seconds based upon the color of the individuals mucosal membrane of the lower eyelid. An important note to mention in this system is that the FAMACHA© eye scoring system is only valid when the parasite of interest is Haemonchus contortus. Using this monitoring system for detecting infection caused by other parasites is not valid. Additional on-farm management practices that could be implemented in an operation include delayed weaning and fall lambing. 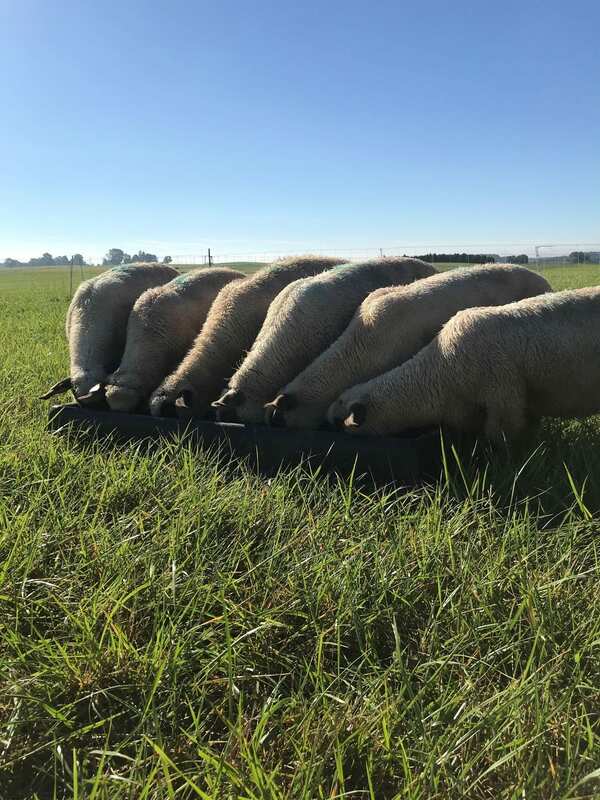 We have already noted the benefits of delayed weaning previously in our article (How can Delayed Weaning Benefit your Operation? ), so we will not cover it any further here. 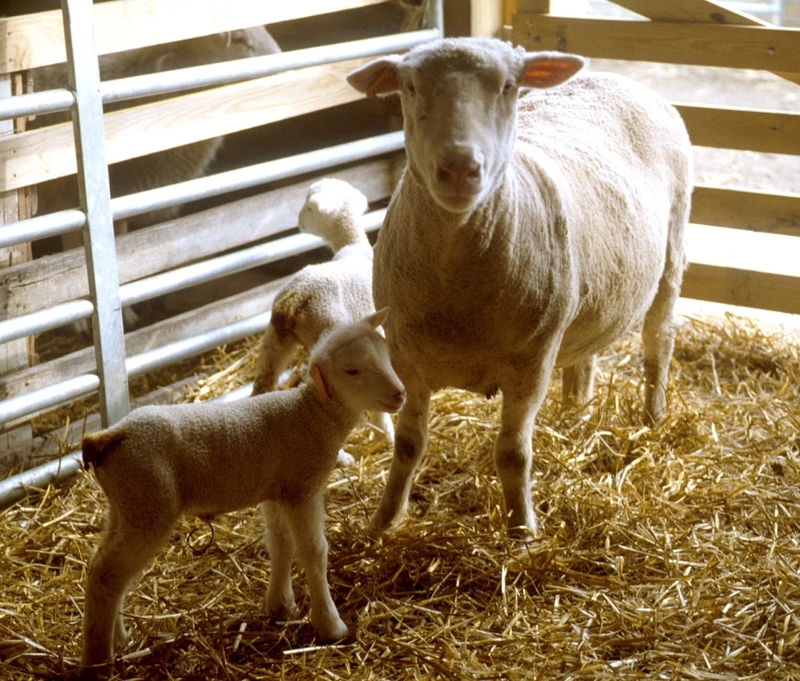 In addition, the use of fall lambing may be a viable alternative as well. Thinking back to our discussion last week, we discussed that the temperature range in which parasites thrive is somewhere between 50°F and 104°F. Using this to our advantage, if producers were to lamb their ewes during the fall when the weather is cooler in conjunction with high quality annual forages, perhaps lambs could be pasture fed during this time period with a decrease in negative effects caused by parasites. This research is currently being conducted and we will be collecting our third and final year of data this fall. Be sure to stay tuned on this piece of grazing research! As a subset of on-farm management practices, when it comes to parasites perhaps a more important aspect would be forage and pasture management strategies. We all know the importance of rotational grazing, management intensive grazing, and strip grazing to mention a few. These types of management systems allow for maximal utilization of forages and have shown to be beneficial to our livestock, pastures, and our wallets. As a refresher, be sure to check out these two Ag-notes! (Comparison of Grazing Systems and Benefits of Rotational Grazing). There are also benefits to these types of systems in regards to parasites. As we mentioned last week, infective larvae can remain viable on pasture for up to 2 to 6 months. Now I know what you’re thinking, “how can we leave our pastures idle for that long without grazing?” This range is for optimal conditions. During the heat of a dry summer, these infective larvae will not remain this long on pasture. In this case, by the time the paddocks are ready to be grazed again, enough time will have passed that the likelihood of reinfection will be reduced. However, what if this is during the warm and wet spring when forages are a peak growth. Allowing livestock to graze the paddock once and then harvesting the next rotation as a hay crop may be a viable and sustainable option. Removing the forage canopy via mechanical harvest and exposing the ground and remaining parasites on pasture to UV light will help dry the infective larvae out, thus rendering them non-viable. Others options on pasture include supplementation of minerals and protein. We have talked before about the importance of mineral and mineral quality (With Sheep, The Cheapest Mineral Isn’t), but mineral also plays a huge role in overall host immunity. For example, minerals such as zinc, selenium, and even copper are beneficial in developing a healthy immune system to cope with parasitic infection. Ensuring that your flock or herd is always supplied with mineral is a must. In addition, research has shown that under conditions of parasitic infection, sheep demonstrate a lack in protein as compared to energy. This makes sense as parasites consume blood, they will also be consuming protein. Therefore, as a means to mitigate these effects, increasing the level of protein in the diet will help aid in coping with infection. Remember, you are feeding livestock on pasture, not feeding livestock concentrates that are housed on pasture. In other words, when supplementing protein, be sure to not to over feed as livestock will eat more of the concentrate, less of the pasture, and make your feeding program more expensive than it is intended to be. One point that we have failed to review is the importance of the forages themselves. Forages that are high in tannins (i.e. sericea lespedeza, birdsfoot trefoil, chicory, and plantain) act as a natural anthelmintics. Directly, these forages are high in by-pass protein. This means that this high quality protein bypasses the rumen, avoiding microbe degradation, and is utilized by the animal. The increase in protein allows the infected animal to cope with infection as we discussed above. Indirectly, these forages and more importantly the tannins, elicit an immune response. 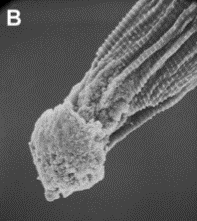 As a result, immune cells will coat the anterior (head) end of a parasite that does not allow for it to attach to the host (see image). Tannins have also shown to play an important role in the obomasal environment as well as they alter the pH and create conditions in which are not favorable for parasite establishment or survival. What we have covered today just begins to scratch the surface on what you can do on your operation to protect your livestock form parasitic infection. Other options may include stricter pasture rotation moves, changes in stocking densities, alteration in grazing periods for ruminants, and the use of technology. We have discussed in great detail the latest technology, BioWorma (BioWorma – Natural Parasite Control and Worm-Trapping Fungs), that has just recently been released in the US. Additional technology that is continued to be looked at here at Ohio State includes the use of an Elutriator. In using an Elutriator, producers may be able to determine the parasite load on pasture prior to grazing. Using this machine may allow for producers to strategically graze their pastures to avoid high-risk situations. Overall, it is ultimately up to you to understand what your parasite status is on farm and what strategies that you should implement in order to mitigate the negative effects associated with infection. If there are any other management practices that I may have left out that you do on your operation, please feel free to share those with me and I would be happy to write another piece on what you as the readers find to be the most effective management strategy on your farm. Until then, happy shepherding! Posted by Braden Campbell at 8:00am April 10, 2019 Posted in Parasites and tagged Management, Parasites. Bookmark the permalink.